Do Thanksgiving pies cause you stress? Let’s be honest, pie-making is not everyone’s jam. If not, no worries. You’re still a good person. Thanksgiving can be stressful enough with the cooking, family drama, travel, and overall craziness of the season. Don’t add more stress to your table with dessert anxiety. Pick a dessert that you feel comfortable making, that sounds tasty, and that you think most people at your feast can eat and will enjoy. What Makes this Vegan Pumpkin Pie Ice Cream a Great Thanksgiving Dessert? Why Put Xanthan Gum in Vegan Ice Cream? Xanthan gum is an emulsifier, thickening agent, and stabilizer. It’s a polysaccharide produced by the fermentation of glucose, sucrose, or lactose. It’s considered safe to eat on most diets, as long as it’s ingested in small quantities. The only negative side effect from xanthan gum that I’ve read about is loose bowels. But, one would need to eat over 1 tablespoon of xanthan gum in a sitting. We typically use ¼ tsp – 2 tsp in entire recipes, so I think it would be difficult to ingest the 1 TBS+ needed of xanthan gum to produce adverse side effects. Overeating many foods by 5-20 times could certainly cause loose bowels. That said, if you do have weak digestion, and have concerns about ingesting xanthan gum, leave it out. 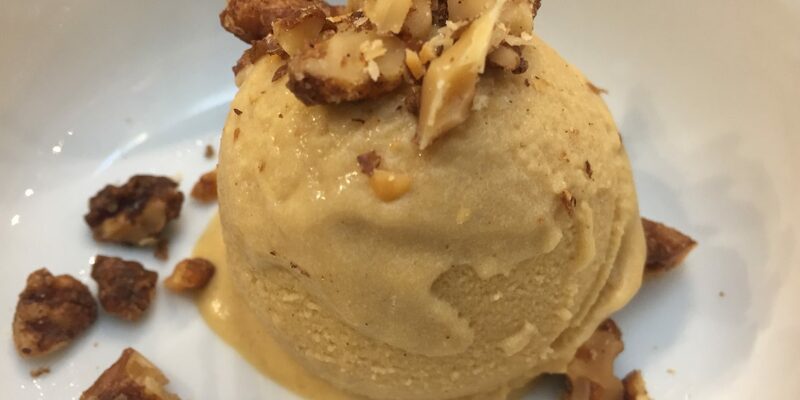 Since we don’t use eggs in vegan ice cream, xanthan gum helps create a creamier texture. The coconut milk and oil also help with this, so you can omit the xanthan gum and still have a delicious ice cream. I prefer the added creaminess the small amount of xanthan gum provides. 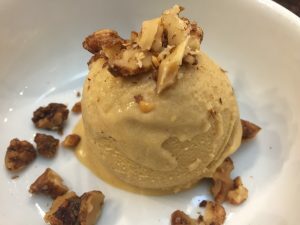 Can You Make this Vegan Pumpkin Pie Ice Cream Sugar-free? Yes! And it’s easy as pie. Just omit the palm sugar and maple syrup and use ½ – ¾ of a cup of Lakanto Monkfruit Sweetener instead. Monkfruit sweetener is sugar-free, has no effect on blood sugar. It’s a great option for diabetics, those on a Candida diet, or anyone choosing to eliminate all added sugar from the diet. 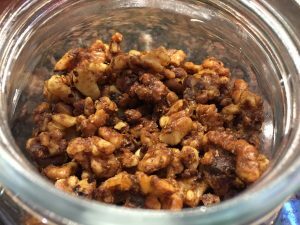 Are Maple Spice Walnuts a Required Topping? 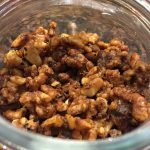 Full of holiday flavor, Maple Spice Walnuts can be made with Pecans, pumpkin seeds, or any nut/seed mix of your choice. It’s your dessert. No topping required. I added them for texture, to provide a little crunch and extra flavor a nut crust would provide. Packed in a jar they make a great holiday gift. You can also keep them on hand for a tasty snack or to put out when unexpected (or expected) company stops by. No matter how you choose to eat this dessert, it’s meant to make your Thanksgiving holiday a little easier. Kick back and enjoy, cause we got this! Now get that shopping list together to make sure you have all your ingredients to make a super tasty, stress-free, Thanksgiving flavor-bomb dessert! Cut pumpkin into even sized 2" chunks. Sprinkle with salt. Put on half sheet pan and roast for 30 minutes or until soft and tender. Combine coconut milk (or cashew cream), palm sugar, maple syrup, coconut oil, ginger, nutmeg, and cinnamon in a medium saucepan over medium high heat. Let simmer for over low heat for about 10 minutes, letting spices cook. You don't want a raw spices flavor in your ice cream. Once they have cooked out remove from heat. Using a pairing knife, remove flesh of pumpkin from the skin and dice into smaller pieces (should get about 5 cups diced). Discard the skin and put the cooked, tender flesh in a high powered blender. Add the mixture from stove, vanilla and the bourbon. Blend on high speed until creamy, 30-45 seconds. As motor is running add the xanthan gum (if using). Let blend for another 30 seconds. Pour mixture into a bowl or pan and put in fridge until completely cold, usually 6-8 hours. Then follow instructions for your ice cream maker. You don't have to add the bourbon, but this small amount won't add a lot of alcohol content and it will add flavor and prevent ice cream from over-freezing. Bourbon is made from gluten-free grains. Put raw nuts in a medium sized mixing bowl. Line a half sheet baking pan with a Silpat or parchment paper. Mix spices and salt together in a small bowl. Melt oil, maple syrup, and vanilla together over low heat. Pour oil, syrup and vanilla over nuts. Stir well. Sprinkle spice and salt mixture over nuts. Stir well. 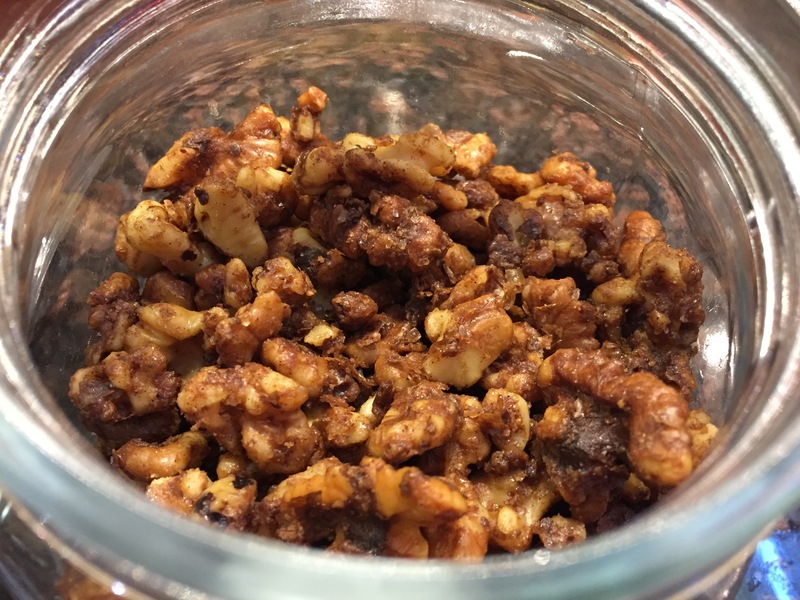 Spread coated nuts onto lined half sheet pan. Bake at 300 degrees for 20-25 minutes or until nuts are golden and crispy. Stir a few times while baking. Nuts will get crispier once they cool. Store in an airtight container in a cool, dry place for up to 2 months. Looks yummy. Can’t wait to try it.